Story’s sister Holly needs help. Her husband has invited some of his employees to their house to relax for the weekend. Now she not only has to find ways to entertain them but also feed them. The kitchen in Holly’s house is state or the art but it is foreign territory as she can’t cook at all. With Story’s help they pull off breakfast and then Story takes them on a tour of her hives. They are enjoying themselves until one of the guests drops dead and Story becomes the prime suspect. It seems the carrot juice she served at breakfast contained poison. This is the last thing Story needs. Johnny Jay can’t stand her and he will try to pin this on her for sure. Plus her hunky boyfriend Hunter just moved into her house with her and a dead body can tend to take away that romantic feeling. She has no choice but to comb through the clues and close the case herself. 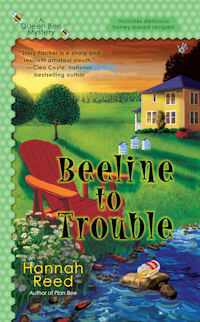 The Queen Bee of the cozy is back again with another tale that is as sweet as honey! I love it! to the beautiful scenery and the caring people. Each and every character is unique, real and believable, even the bad ones. Pity Party Patty just cracks me up and she was in the middle of it this time. Even with her unusual past, deep down we all have a P.P. Patty in our lives. Hannah Reed writes a smart mystery with the perfect amount of humor set is a place that is a beehive of activity. Bee smart and buzz over to the bookstore and pick this one up today. You will Bee thanking me!!! BUZZ! BUZZ! BUZZ! To find out more about Hannah Reed visit here webpage here. As always enjoyed the reveiw. Thanks. Always on the look out for good cozies. I’ll put this one on my list. Thanks.